There lived a number of of squirrels in a forest near a hill. These squirrels were very mischievous and spent the day long in playing. Besides walking through the forest daily it was also the part of the squirrel's routine to go on the near by hill. Whereas the hill became jealous inside heart by seeing them happy. One day the squirrels were busy in gossips when the hill said rudely. All of you disturb me daily with your playing. I do not like your presence at all. In fact he could not bear their happiness and he was looking at them with envy. Among all these squirrels one squirrel was aged and wise. She asked the hill by stepping forward. Dear hill why are you scolding us? we have not said any thing to you listen let's enjoy together By listening to the squirrel's speech the hill got sad. When the squirrel asked the reason of sadness the hill said, ''I cannot change my place like you and cannot play and jump too. I have such a huge physique that I cannot even change my place according to my will. But all of you become a source of my sadness by coming here daily. I also want to enjoy playing like you but I cannot do it because of my heavy physique. 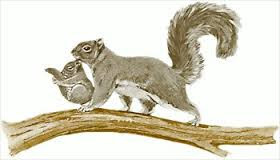 After listening to the hill's speech the squirrel consoled the hill and said: The hill brother! Why do you feel sad? You should thank God all the time that because of your huge physique the rest of the creatures get a lot of benefits. You can change the direction of winds and clouds floating on sky because of your huge physique you can lessen the intensity of storms. That is why be happy. The hill felt guilty on his behaviour by listening to the squirrel's speech. He repented to be jealous in future and Thanked God that he did not make him useless. Moral lesson: Nothing is useless in the universe.